Special Containment Procedures: Due to its nature as a prominent fixture in New York City, it is impossible to remove or isolate SCP-4102. SCP-4102 is monitored in an eight (8) block radius by MTF Gamma-5 ("Red Herrings") around pedestrian walkways leading to SCP-4012. Units are to be disguised as NYPD officers patrolling the area at all times. Upon visual confirmation of SCP-4102-1 engaging civilians, MTF Gamma-5 units are instructed to intervene and process civilians at least two (2) kilometers away from SCP-4102-1's contact point. Civilians having made contact with SCP-4102-1 are to be interviewed before being administered Class-A amnestics and released. Guards, also disguised as NYPD officers, are to be stationed outside the Manhattan vault doors of SCP-4102 to deter unpermitted entrance. SCP-4102-2 is unable to leave the confines of SCP-4102's Manhattan vaults, re-appearing in a random area in the vaults once taken two (2) meters to the entrance. All attempts to isolate SCP-4102-2 into a specific part of the vault system have proven fruitless, as it simply re-appears somewhere else in the vaults on its own volition. SCP-4102-2 is to be visited weekly by authorized personnel. Following good behavior, SCP-4102-2 has been allowed one (1) bed, one (1) television with access to news and television shows, a collection of assorted fiction books and a writing pad with pens. Any additional requests are to be taken to the project director. 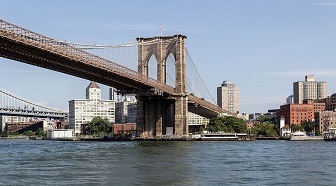 Description: SCP-4102 is a bridge connecting New York County and Kings County, known publicly as the Brooklyn Bridge. According to data compiled from SCP-4102-2, SCP-4102's anomalous nature did not manifest until 18██1. SCP-4102's anomalous effect manifests itself with iterations of SCP-4102-1, and by extension, SCP-4102-2. SCP-4102-1 is a humanoid entity which manifests itself between the hours of 08:00 and 22:00 on either side of SCP-4102. SCP-4102-1's height, weight, ethnicity and gender vary according to each iteration. All documented instances of SCP-4102 have been shown to be fluent in the native language of the person it targets. Only one (1) instance of SCP-4102-1 is ever active at a time, with windows of appearance ranging from every 30 minutes to every 2 hours. This variation in appearances seems to correlate with the amount of attention SCP-4102 gets from civilians who are not citizens of the City of New York, Nassau County, Suffolk County or the State of New Jersey. Methods to document SCP-4102-1 manifesting or disappearing have proven unsuccessful with both digital and physical surveillance. When active, SCP-4102-1 will locate an individual over the age of 16 who is alone and admiring the bridge and will proceed to talk with them. SCP-4102-1 has been observed using different tactics in speaking in order to connect with their target. Topics of conversation begin in a variety of fashions, such as talking about the weather, or the results from the latest football game. Eventually, approximately fifteen (15) minutes into the encounter, SCP-4102-1 will discuss the bridge and prospects for purchasing it. About 91% of encounters typically end during this period due to a lack of belief that the bridge can be purchased. Following such events, SCP-4102-1 thanks the individual for their time and walks away, vanishing once it is out of view. Following thirty (30) minutes of interaction with SCP-4102-1, the subject will become increasingly agreeable and will express a great desire to purchase SCP-4102. Interviews with subjects beyond the thirty minute mark have shown elevated signs of optimism at the prospect of buying SCP-4102, seldom wanting to talk about anything that does not relate to SCP-4102. See Addendum 4102-02 for details. SCP-4102-1 appears to fear anyone it deems to be an officer of the City of New York, and has been noted to flee on foot immediately upon an officer or a disguised agent breaking up an interaction between itself and its designated target. SCP-4102-1 is able to run at speeds of approximately twenty-eight (28) meters per second in order to escape, showing great skill at maneuvering around bystanders and cars before it is out of sight. Citizens present during SCP-4102-1's escape, when collected for interviews, have shown no memory of ever seeing SCP-4102-1. Subjects who were unable to complete their transaction with SCP-4102-1 following the thirty minute mark will proceed to wait in an eight block radius from where they encountered SCP-4102-1, until it re-appears, stating their only wish is to "buy the bridge". Additionally, subjects will cease showing an obsession to buy SCP-4102 if placed two kilometers away from SCP-4102, though they will still retain all memories associated with it. If a subject is present during the next window of SCP-4102-1 re-instancing, they will talk with SCP-4102-1 for up to two (2) minutes before ending the conversation with a handshake. SCP-4102-1 and the subject will proceed to walk under SCP-4102 and vanish when out of sight. As of Foundation acquisition, missing persons reports in SCP-4102-1 operation areas have decreased by ██%. SCP-4102-2 appears to be a human of indeterminate gender, roughly two (2) meters in height. SCP-4102-2's skin is covered in five (5) sq cm pieces of chipped bricks, with different names and dates etched in each. The names and dates carved into the stones appear to correlate with ██% of missing persons from 18██ to 20██. Testing has shown that these bricks cannot be removed from SCP-4102-2, though fragments can be chipped off and analysed. Mineral testing has shown that these bricks are composed of limestone and granite2. SCP-4102-2 is able to speak in any language presented to it, though it defaults to English spoken in a New York City accent typical of the late 1800s. SCP-4102-2 is usually cordial and agreeable to Foundation requests and questions, apart from requests to leave SCP-4102's vaults, which causes it great distress. SCP-4102-2 has stated that it is as old as SCP-4102, and tends to refer to itself in the plural tense rather than singular. SCP-4102-2 states to have never known its own name, and has taken its Foundation classification as an acceptable alternative. See Addendum 4102-3 for details. SCP-4102-2 does not require sustenance of any sort, though it claims to sleep on occasion "to help the time pass". X-Rays indicate that there is a human skeletal structure inside SCP-4102-2, though other internal structures are made of Rosendale cement3. SCP-4102-2's body is nearly impervious to any damage, as any damage to its being is quickly regenerated. SCP-4102-2 has never shown itself to be hostile towards any requests or questions from Foundation staff, though Foundation psychoanalysts state that SCP-4102-2 is currently suffering from severe depression. Requests for psychiatric treatment are pending. Following a maintenance check in 19██ by New York City DOT4 personnel in SCP-4102's vaults and the discovery of SCP-4102-2, the Foundation assumed control of the complex. Class B amnestics were administered to NYC DOT personnel following this. Interviews with SCP-4102-2 revealed the existence of SCP-4102-1, which correlated with a number of missing persons reports in the area since 18██. Foreword: Subject 4102-1 was retrieved following a thirty-one minute interaction with SCP-4102-1. SCP-4102-1, in this instance, presented itself as a blond middle-aged Caucasian male of medium build standing at approximately 1.8 meters, dressed in a suit and tie. MTF Gamma-5 agents, disguised as local law enforcement, broke up the conversation. Following SCP-4102-1 fleeing on foot, Subject 4102-1 was collected into Foundation custody and transferred into a site 3.2 kilometers away from SCP 4102 under the pretenses of gathering information for capturing a known con artist. Subject 4102-1 is a ██ year old Caucasian male who claims to be a tourist from ██████████, California. Agent Parker: We appreciate you coming in, Mr. █████. Subject 4102-1: It's no problem. Anything I can do to help our boys in blue. Agent Parker: Many thanks, sir. What can you tell me about the suspect? Subject 4102-1: Well, not much to say. I came to visit New York with my family. You've gotta see the Brooklyn Bridge, y'know? It's really beautiful. Anyways, they went to find a bathroom or something, so I decided to stay there and get some photos. Agent Parker: And that's when the suspect appeared. Subject 4102-1: Yeah. Seemed like a Wall Street type, a guy who knows his stuff. Said he walks by the bridge on his way home from work at the exchange. Asked me if I saw the ███ game last night. What are the odds that he's into soccer AND likes my favorite team? Agent Parker: I see. Continue. Subject 4102-1: Yeah. So we're talking and I tell him about myself. He seemed really easy to talk to, like he knew just what to say to keep me going. I tell him about my marketing firm, then about my family. My stock portfolio wasn't doing so great, and that's when he mentions the bridge again. Something about how the city was ready to open it up to private ownership. Made sense. If you can buy land, why not a bridge? Good ol' fashioned capitalism at work. Agent Parker: And this didn't seem strange to you? Subject 4102-1: Initially, yeah. But we kept talking about it for ages, and he made it seem so lucrative and…I don't know. Believable, I guess? Like a trance. So anyway, when you guys came, he booked it. I told myself that I'd go back to meet him there after you guys picked me up, but now…now it seems pretty stupid, huh? Agent Parker: These kinds of people are good at pressing buttons. You can't blame yourself. Subject 4102-1: I guess not. Closing Statement: Following the interview, Subject 4102-1 was administered Class A amnestics and released without incident. Foreword: At this point in time, SCP 4102-2 had been in Foundation custody for █ days. Agent Parker: How are you doing, 4102-2? SCP 4102-2: Hm? Oh. That's us. We forget, sometimes. Fine. But you're not here about that, yeah? SCP 4102-2: You're here 'bout the bridge. How it does this. SCP 4102-2: We don't know. It makes deals and it collects. It collects a toll. Agent Parker: When did this start? SCP 4102-2: It got an idea from someplace. No one trusted this thing to last, ya know? Barnum had to parade elephants on it to prove a point. It got self-conscious, maybe. All the attention definitely didn't help. Then some guys come pretending to pawn it off. Agent Parker: You're saying that 4102 has feelings? SCP 4102-2: (4102-2 shrugs) We get an inkling from someplace. Deep in the walls. Livin' in the city, y'know, makes you gotta prove yerself. It collects the toll so it has somethin' solid to have. (4102-2 sighs) It was the first of its kind. Roebling babied it5. It felt like it was cared for. A real personal connection you can't get anywhere else. It's doing its best. But sometimes…sometimes it wants to crumble. Closing Statement: In the years following containment, SCP-4102 was noted to show a slight swaying motion, indicative of possible structural defects. Whether this is due to increased traffic, or preventative methods applied to SCP-4102-1 is unclear. 1. This coincides with the arrest of notorious conman George C. Parker. 2. Primary materials made to construct SCP-4102. 3. A natural cement made in Rosendale, NY. Used commonly in constructing United States National Monuments. 4. New York City Department of Transportation. 5. John Augustus Roebling, head engineer for SCP-4102, or Emily Warren Roebling, who supervised remaining construction after his death.